Find it quick by downloading to the desktop. These are the best 3 sales formats that are most used when creating resumes. Go ahead right away and start your editing, using different styles, try using bullets to make items list or just see what it is you can add to it that's different until you get satisfied with the look. After all, is that not the whole idea for being here? 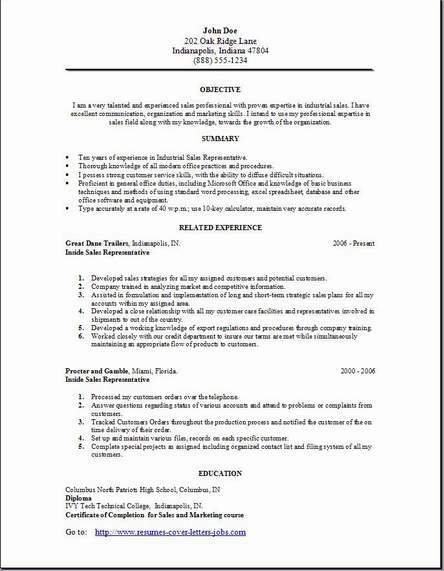 So once this resume is completely edited with your current information, you can get a better idea of the look and feel of it. Try to keep editing all the examples above using different techniques. 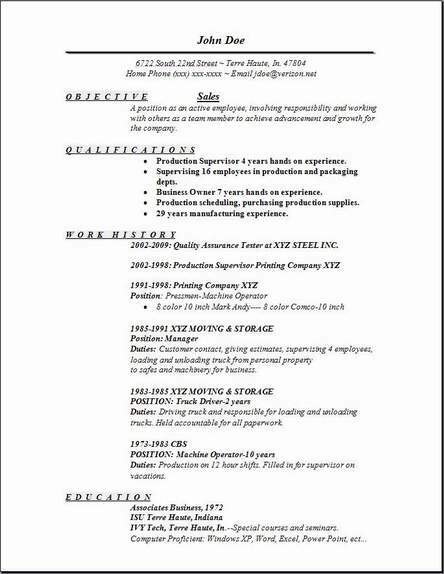 Bold type, or try Italic, the main thing is that you are satisfied with the look of it after you have your own information solidly imprinted into the sales resume examples. I also hope that you find these free sales samples useful. Try visiting some examples at the other pages and look at the other samples to get some suggestions on what to add. 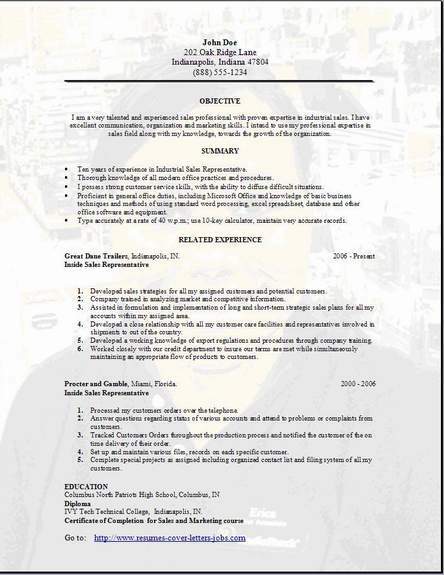 The Inside Sales Representative is responsible for: order entry, status maintenance, and expediting of customer orders. Your goal is to correspond with the customer on a daily basis in an effort to meet and exceed the customer’s requirements. -Communicate customers where in production their order is and shipping date. -Provide any reports for any customer order as needed. -Status maintenance; Restarts and Closing Orders. -Increased Sales / Cold Calling. The Inside Sales Representative must maintain open lines for communication with customers and plant operations. The sales position can be a very rewarding career. Most of the time you will develop a long lasting relationship with your customers on a first name basis. Also knowing that you helped supply them with what they needed in a very organized fashion, well, the reward is there every day. Drop me a comment back on the contact us page with suggestions of anything else you would want to be available for you to use and benefit from, I would like to hear good or bad. I prefer to just try everything I can to give you more options you can use.